The lands of the High plains have been inhabited for thousands of years by tribes and herds, crossed in 1540 by the Spanish explorer, Captain Francisco Vasquez de Coronado, who searched for Golden city of Quivira, and then settled by Euro-American immigrants in the late 1800s. Lubbock County was formed out of Bexar and Young Territories in 1876 as one of 21 counties, and became officially organized on March 10, 1891. Jails were some of the first public buildings erected in these budding communities, and as they prospered, the West Texas’ landscape became dotted with brick fortresses and crenelated castles. On May 11, 1891, the newly functional government approved the first county building, a jail that would also provide the churches of Lubbock a place to congregate after a festive Saturday night. The jailhouse served the community as a temporary school and social center since the construction of buildings with lumber was scarce on the Llano Estacado until the railroads reached the area. Later that same year, a two-story frame courthouse was built enabling church members to use the new county building as their meeting place, rather than the jail. Within the next nine years the population soared to almost 300. The four-cornered courthouse was the heart of this little high plains town, especially since the public windmill and water trough served for many years as the town’s nearest source of potable water. The City of Lubbock incorporated in 1909. In the late 1920’s a new Lubbock County Jail was built on the site where two previous jails had stood. The construction of the reinforced concrete structure was finished in 1931 at a price of $135,000. A local architect, Sylvan B. Haynes, designed the structure with a distinctive Art Deco style. Although initially designed as a five-story building, only three stories were constructed in 1931. In 1951 the last two floors were added bringing the building to its present height of five stories (Crites, 1984). 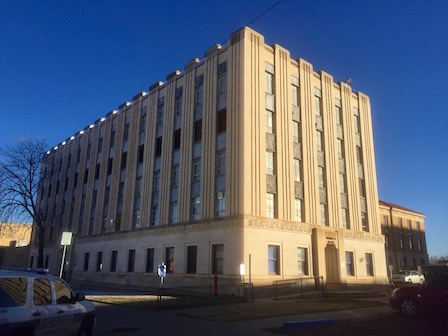 The Lubbock County Jail, unlike many buildings in the Art Deco style, did not have a central dominant feature with distinctive massing setbacks. Instead, the building is a simple rectangular box with Art Deco design elements applied to the façade(Crites, 1984). The exterior smooth stone base of the first floor gives a distinction between the building’s lower and upper levels. Decorative lead panels above the windows on the first three floors are embossed with an art deco floral motif. Vertical relief piers capped with a stone parapet extend above the roof creating a crenellated form to complete the design. The building structural and floor system is reinforced concrete beams and slabs. The useful floor to ceiling height is generally 7’- 0”. Interior jail cells, located on the third through the fifth floors, leave a circulation corridor around the outside perimeter of the space. Daylight within the cells comes from windows on the exterior walls. This particular concrete structural system makes it difficult to adapt with a rehabilitation project since it limits the use of the space. The 1931 Lubbock Jail is essentially empty and has not been used for prisoners for several years. When new facilities are completed for the Sheriff’s department, the first two floors will also be empty. A two-story prison extension building was built later, and covers the eastern half of the same block. It is also in disuse. The 1931 Lubbock Federal Courthouse and Post Office share the block with the distinctive Art Deco Jail. After standing vacant, under threat of demolition for many years, the Courthouse and Post Office building was bought in 2014 by real estate developers. Construction has begun to adapt the building into condominiums and a variety of other uses. Preservation Texas recognized the 1931 Lubbock Federal Courthouse and Post Office on the 2011 Texas Most Endangered Places List. The current rehabilitation project will join other significant downtown buildings to help maintain the unique character of Lubbock. The 1931 Lubbock Jail listing on the 2016 Most Endangered Places List, will be the next preservation achievement that supports West Texas heritage by maintaining its authenticity. Crites, Mary. 1984. NRHP nomination, unpublished.